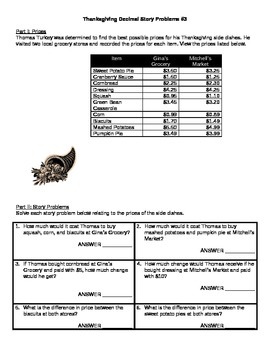 These are fun decimal story problems that revolve around various Thanksgiving themes (temperatures on Thanksgiving day, weight of turkeys, and prices of Thanksgiving side dishes). All items are fully editable for you to incorporate your own students' names. Each story problem requires students to think critically before solving can begin. Sample Problem - What is the difference between the high and low temperatures for Phoenix? Sample Problem - Round the weight of Isabelle’s turkey to the nearest hundredth. Sample Problem - How much would it cost Thomas to buy squash, corn, and biscuits at Gina’s Grocery?